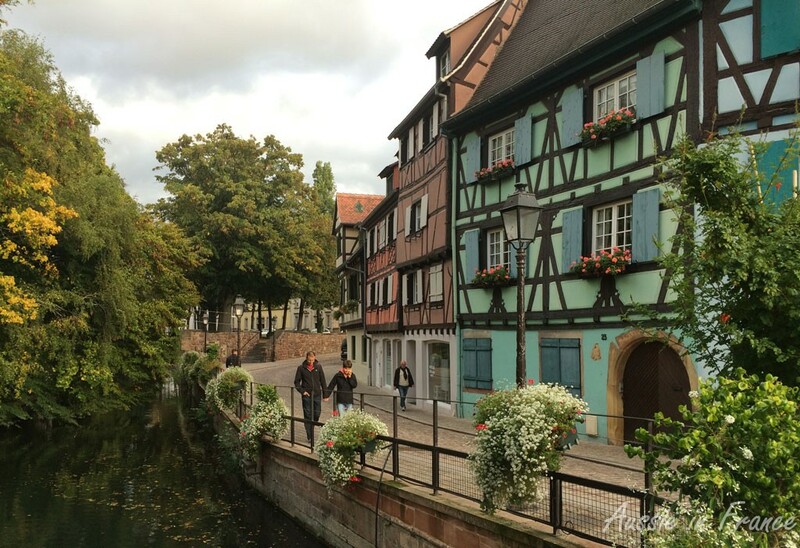 Alsace is one of France’s most picturesque regions and has a lot in common with its neighbour, Germany, in terms of architecture, customs, cuisine and even language. It is famous for its white wines and the vineyards grow at the foot of the gently sloping Vosges mountains. 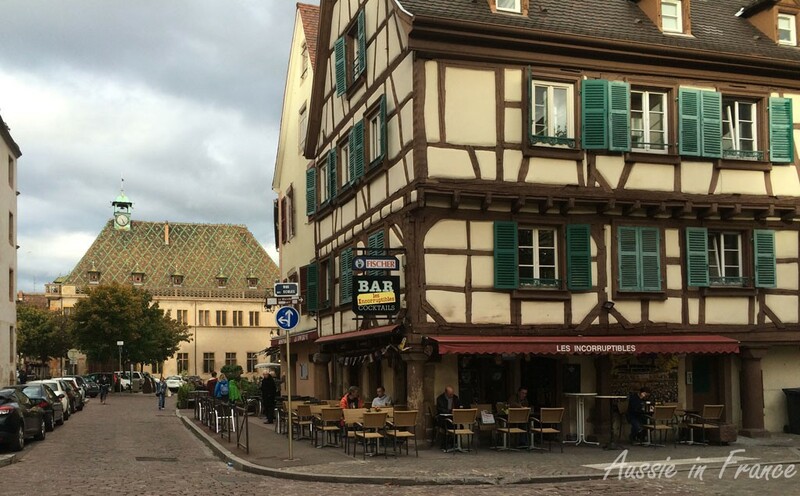 I have been to Colmar twice before, once with Black Cat when she was thirteen (18 years ago) and once with Jean Michel, 14 years ago, when we spent two weeks visiting such lovely little villages as Roquewihr and Haut Koenigsbourg and tasting wine. I remember liking it on both occasions, but am a bit worried that I can’t remember it at all except for one particular place on the canal. Jean Michel only remembers a couple of things as well. Built in 1609, La Maison des Têtes (House of Heads) owes its name to the 110 masks and grimacing faces which decorate the façade. 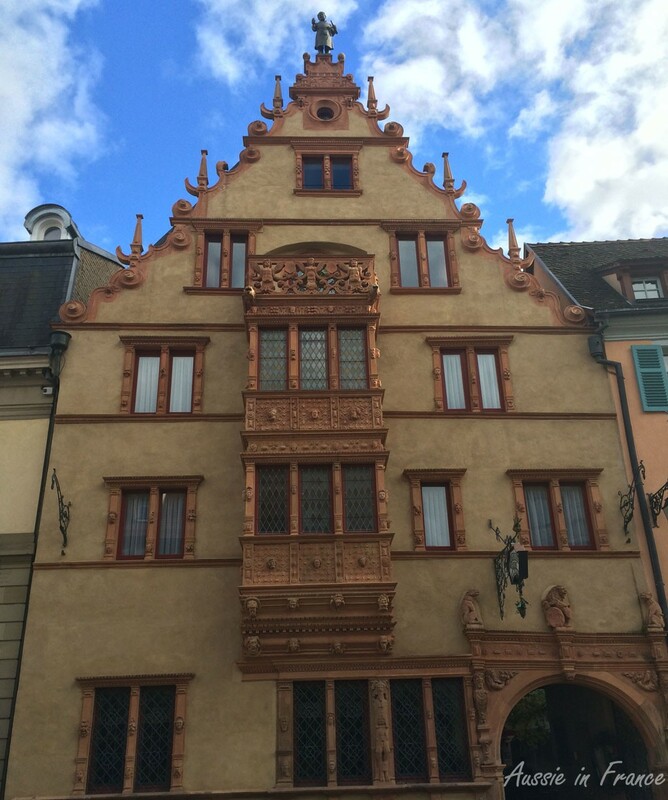 The magnificently sculpted oriel rises to three levels. 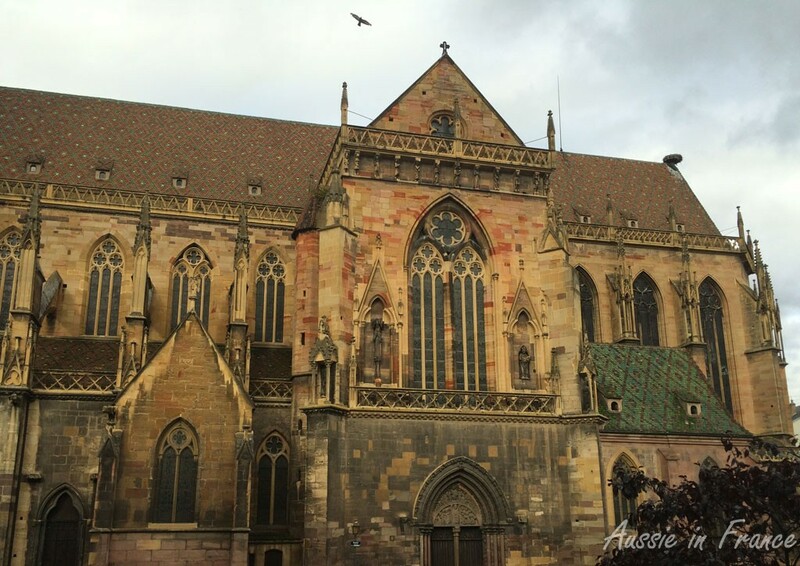 The statue of the Alsace barrel maker was placed at the top of the gable when the building was used as a wine exchange. With a little over two hours before sunset, we head straight for the tourist office after checking into our hotel and follow the itinerary proposed in the brochure. A more leisurely visit would have been better just to soak up the atmosphere and appreciate all the lovely half-timbered houes. We are also surprised by how busy the centre is. Lots of school children and their parents suddenly flood the streets. 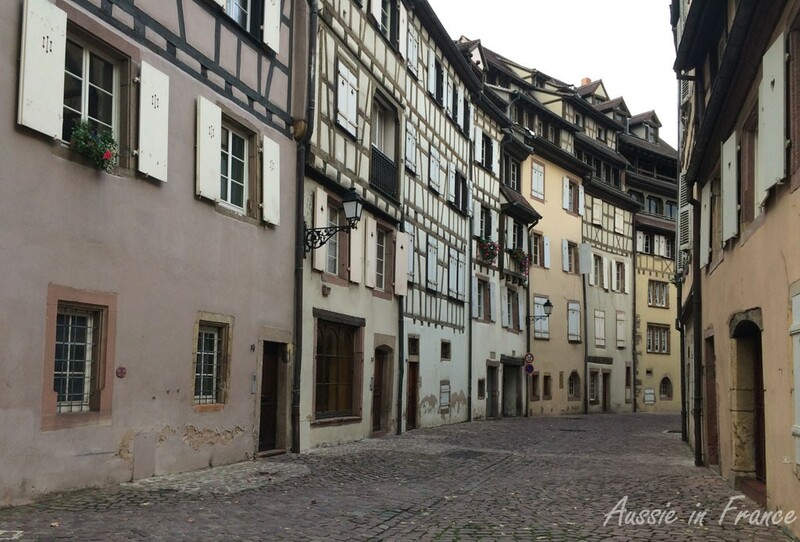 Left, Maison Adolph, probably the oldest house in Colmar built in about 1350, with its gothic pointed arch windows. Right, the guard building, constructed in 1575. The loggia was used by the magistrate to hand down sentences. 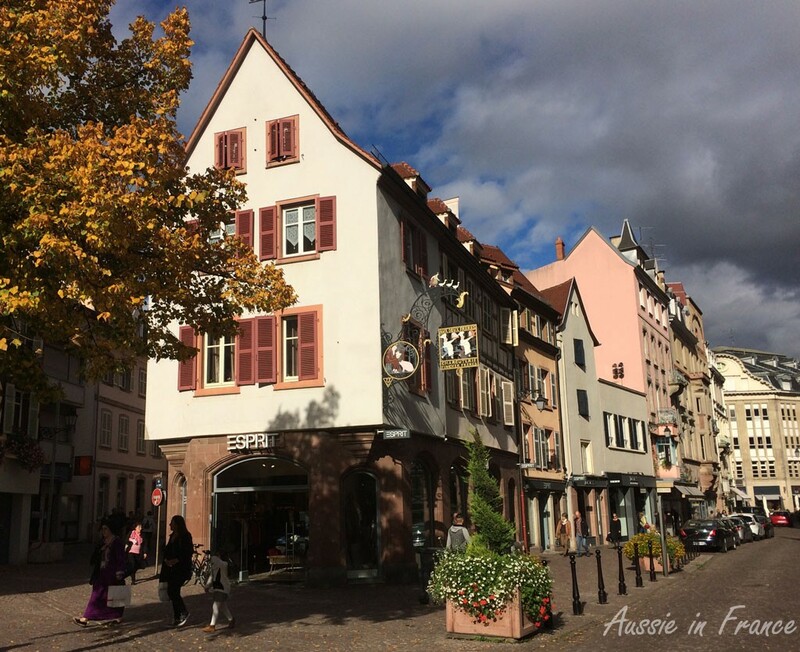 At 6.30 pm, we have finished the tour and can have a well-earned glass of local riesling and a flammekeusche, the thin-crust onion, bacon and cream tart so popular in the area. We find another venue for dinner and another well-known local dish: sauerkraut, pork and potatoes followed by an ice-cream kugelhof. By now, the streets are nearly deserted. No sign of any harvest bread or vin nouveau. Next time maybe! Tomorrow we’ll be back in Blois. 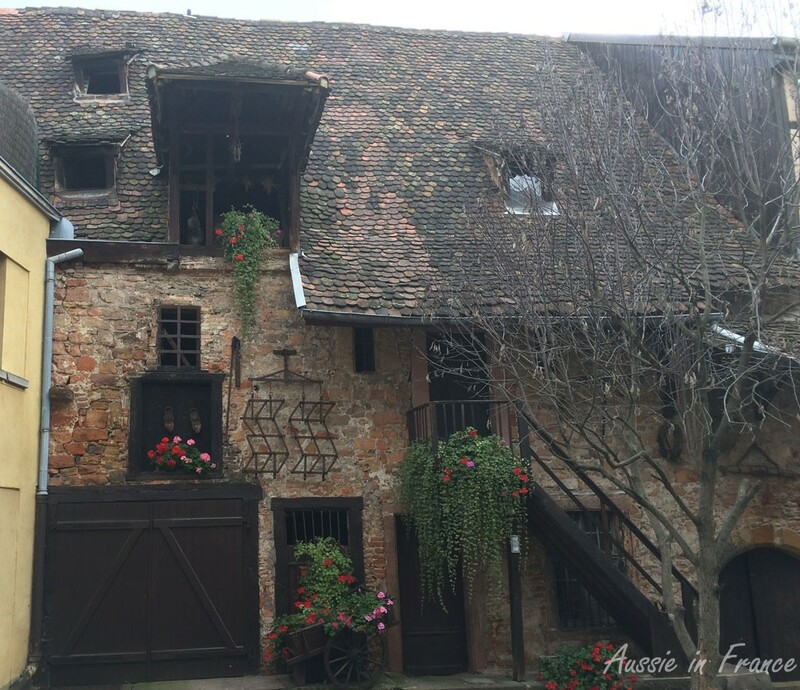 This post is my November contribution to Lou Messugo’s All About France link-up. For other posts about France, click here. 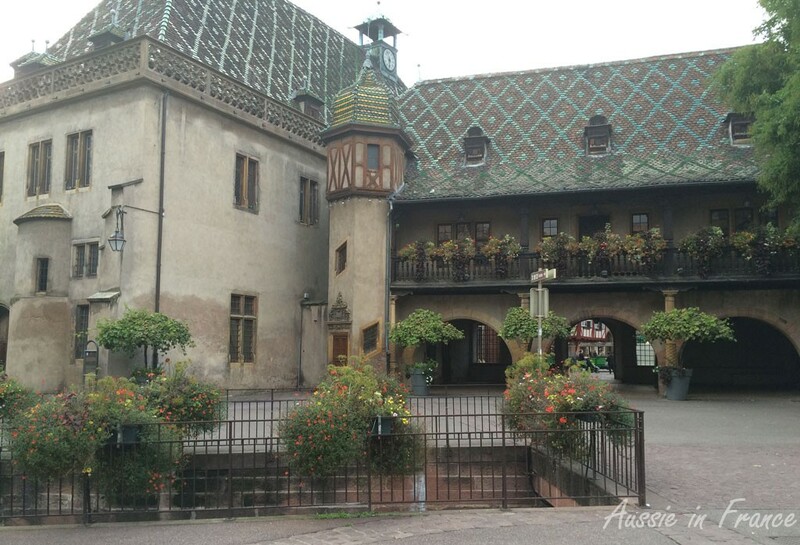 This entry was posted in Architecture, France, Sightseeing, Travel photos and tagged Colmar, house of heads colmar, pfister house, visiting alsace, visiting colmar. Bookmark the permalink. It all looks most picturesque, and with reisling and flammekeusche, what’s not to like?! Yes, glazed would certainly be better :). I suspected it was wrong but couldn’t find the right word. Quite an inviting place. The House of Heads really stands out among these shots! I am constantly amazed at the wonderful variations of the different French regions and departements. 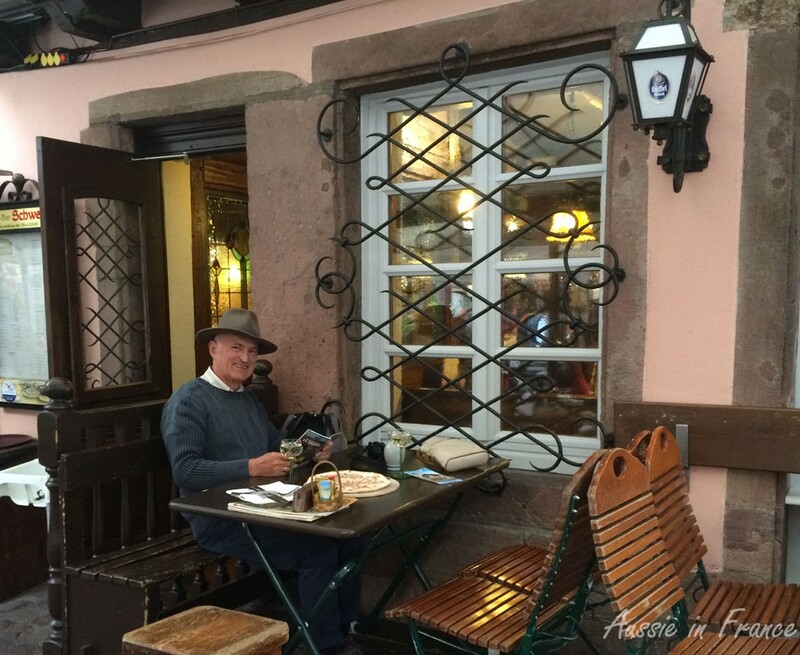 Jean Michel really looked the part outside the cafe – especially with his hat! Yes, his Aussi Akubra always looks the part! Comar is one of my favorite towns and you captured the essential beauty as well as its “ambience” in these photos! Thank you, Jacqueline, it is a lovely town. 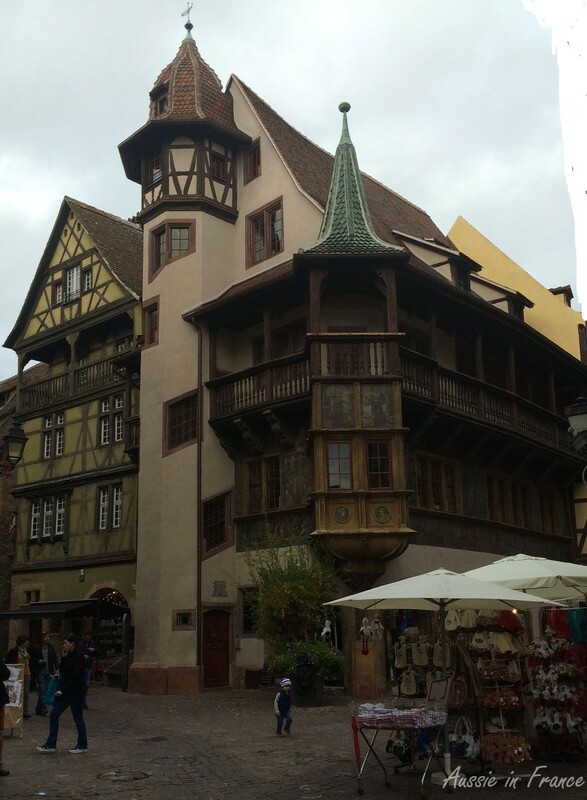 Colmar is so amazing. I was able to stop through on my way moving from France to Germany, and couldn’t have had a better “farewell for now” to France. 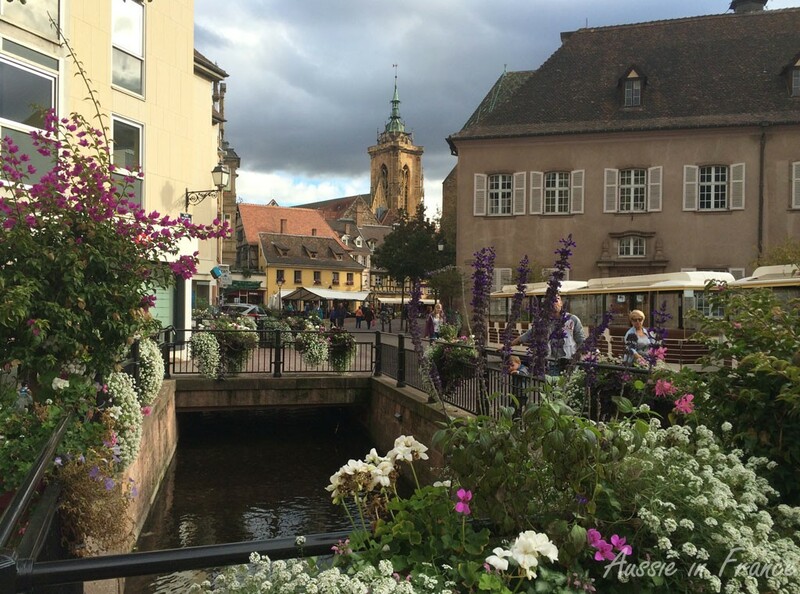 Beautiful photos and Colmar/Alsace should have more credit as a rich and wonderful region of Europe! I’ve never been to Colmar, or anywhere in the east of France. Hope to get there one day. Lovely pics! 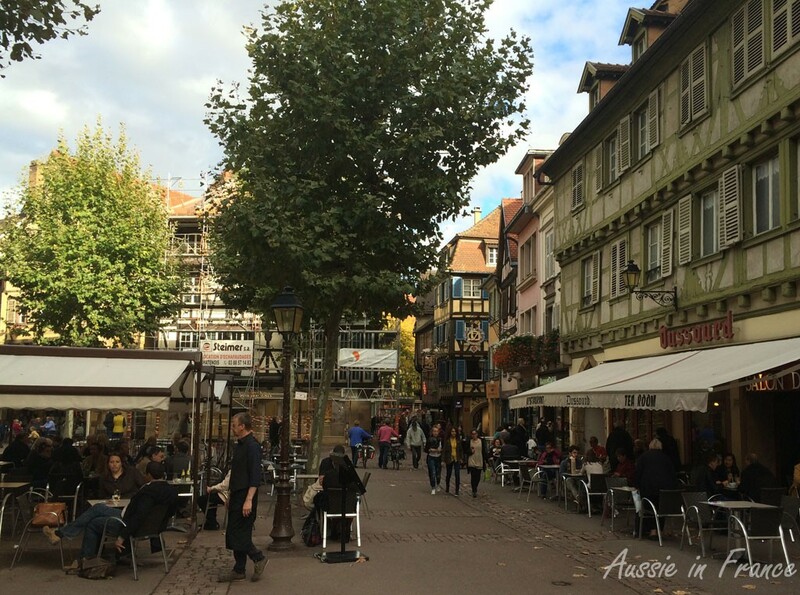 Colmar is the perfect destination at Christmas. I imagine all the Christmas markets are lovely. Your photos are just gorgeous!! 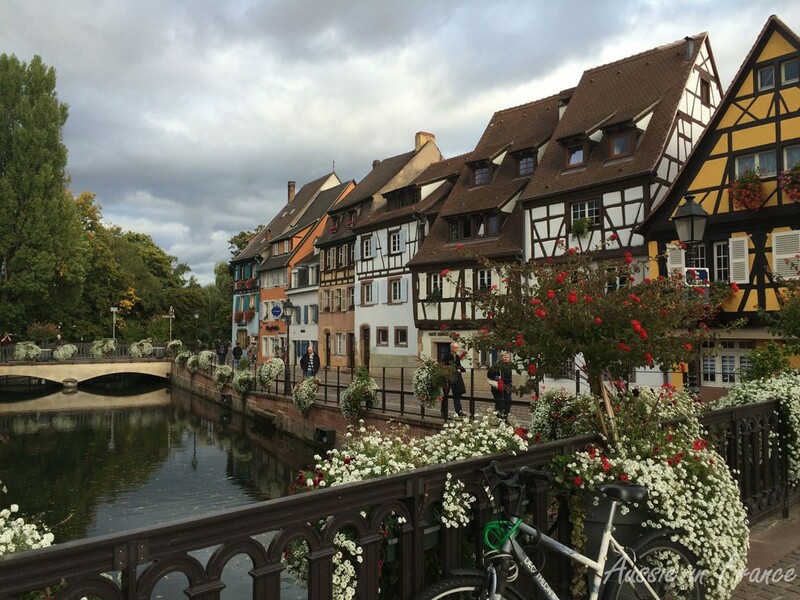 When I visited in May, I was bracing myself for disappointment – I felt like I had heard so much about how cute Colmar is, that surely it would be over-hyped. I left just charmed, and wishing I had more time to explore the area. 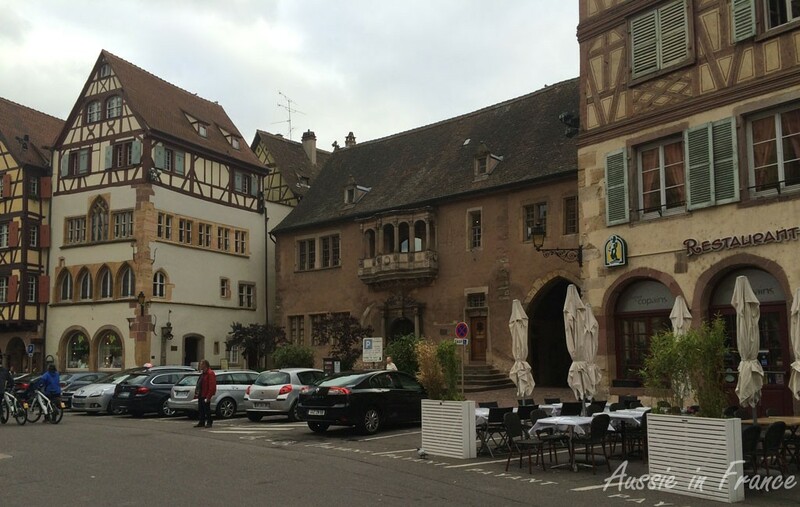 It truly is a little French gem of a town! 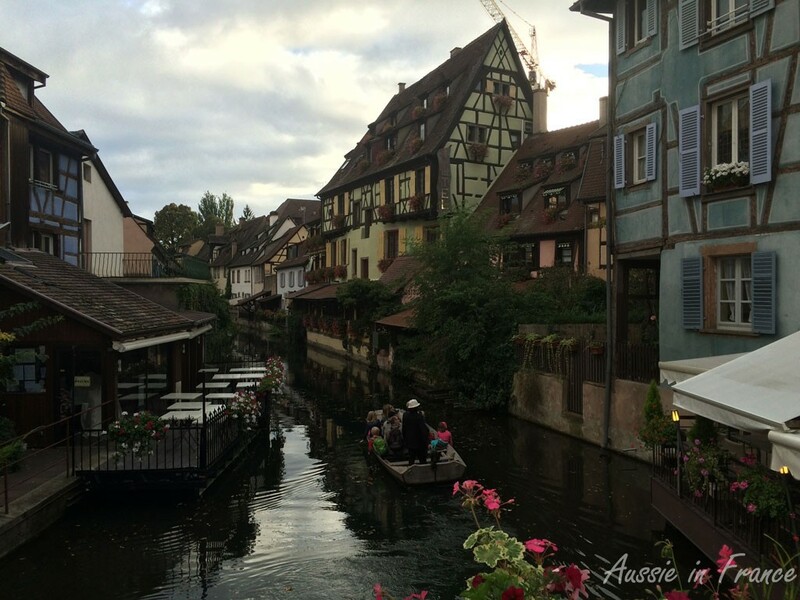 I’ve been to Colmar once but only overnight at Christmas time so I think it was dark the whole time I was there! I remember it being magical and festive but I didn’t get to see the canal or many of the pretty half timbered streets. I definitely want to go again in spring or summer. Ice cream kugelhof sounds delicious. 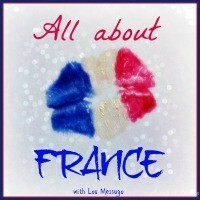 Thakns for linking up to #AllAboutFrance Rosemary. I’m sure you won’t be disappointed if you go back in spring or summer. Such as lovely place. Thank you for organising #AllAboutFrance Phoebe.